We're now selling the Girl Online pencil case and tote bag. Click here. You know when you shake a Coke can and then you open it and it explodes everywhere? Well, that’s how I fell right now. I have so many things fizzing up inside of me, but I don’t have the confidence to say them out loud. 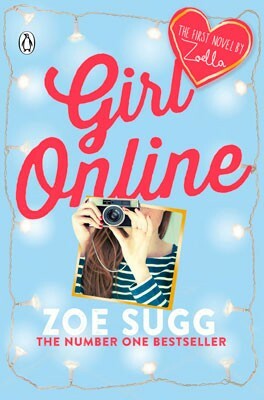 In Zoella’s New York Times Bestselling debut, Girl Online, we meet Penny Porter for the first time, a teenager with a secret; using the alias Girl Online, Penny blogs her innermost thoughts and feelings to the world. Penny treats readers of her blog to the inside scoop on her friendships, her school, her ‘crazy’ family, and the panic attacks that threaten to take over her life – but of course, no one in her day-to-day life knows Penny is ‘Girl Online’. Life, however, is not the perfect picture that it appears to be because, as it turns out, Noah has a secret as well; one that could to ruin not only Penny's anonymity - but - more importantly - it could destroy her closest friendship too. Girl Online is first instalment in the Girl Online series. Zoella has recently launched her first interiors range: Zoella Lifestyle. Zoe Suggs AKA Zoella is a fashion and beauty vlogger, a YouTuber, and an author. Commanding an enormous international following, her main Youtube channel has over 9.9 million subscribers. The Daily Telegraph named Zoella as “One of Britain’s most influential Tweeters” in 2013, and she was the first “Digital Ambassador” for the Mental Health charity, Mind, in 2014. Absolutely loved ths book. Couldn't put it down and went straight on to the next one.